Edna has been seen in the company of some very handsome Scottish fellas of late and she is clearly inspired by their attire! 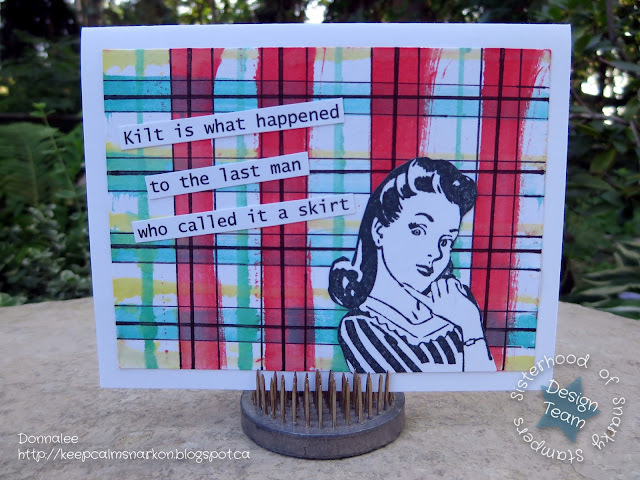 Edna (as do we all) is always curious about what's up yer kilt...so much so that she made it the theme for our newest SISTERHOOD OF SNARKY STAMPERS challenge!! You always rock the challenges and inspire me. Hilarious sentiment AND home made plaid - absolutely perfect! Hahahahaha ... you nailed this one!